Greetings from The 88 Project! We are bringing you news, analysis, and actions regarding human rights and civil society in Vietnam during the week of January 21-27. Vietnam has arrested two people for their activism, Chau Van Kham, an Australian democracy advocate, and Nguyen Van Vien, a member of the Brotherhood for Democracy. This week, citizen journalist Do Cong Duong’s five-year sentence was reduced by one year on appeal; he will serve those four years along with four other years under a separate charge. Five other men affiliated with a group calling for political change were supposed to face an appeal trial this week, but it was cancelled after one man’s lawyer did not appear in court. This group includes Luu Van Vinh, who is facing a sixteen-year sentence. US citizen Michael Nguyen remains detained in Vietnam, and authorities this week summoned a well-known female activist for questioning in his case. Truong Huu Loc, who participated in June 2018 national protests, also remains detained after eight months. This week, we remember the 22 members of the An Dan Dai Dao religious group who were convicted for activities related to running an eco-tourism company, imprisoned female activist Tran Thi Nga, and four Hoa Hao Buddhists who were sentenced to prison in January 2018. A man and his friends were briefly detained this week for wearing a shirt protesting the new Law on Cybersecurity. And several communities are at risk, including five people in Loc Hung who are being prosecuted for allegedly inciting protests during recent forced evictions and a religious community in Kon Tum Province whose pagoda was destroyed by authorities. In international advocacy, read about Vietnam’s Third Cycle of the UPR, and in analysis, read two opinions about attitudes towards Vietnamese human rights and its defenders. Please take action with ACAT-France to call on the French President to raise human rights with the Vietnamese government in their expected interactions in 2019. Vietnam has arrested two more activists, Chau Van Kham, an Australian citizen, and Nguyen Van Vien, a member of the Brotherhood for Democracy. They were arrested on January 13 in Ho Chi Minh City. Kham, a member of overseas democracy group Viet Tan, was in Vietnam on a “human rights fact-finding trip.” Vien had become an environmental activist in the aftermath of the Formosa environmental disaster. He is supposedly charged under Article 109 of the 2015 Criminal Code for subversion. According to a press release from the Brotherhood for Democracy, police arrested Vien when he was on the way to pick up Kham. Kham has not been permitted consular communications. One year ago on January 24, Do Cong Duong was detained in Vietnam while filming a forced eviction. Duong, who also ran an online video channel, was sentenced to nine years in prison in two separate trials. On January 23, 2019, his sentence of five years for “abusing democratic freedoms” was reduced to four years on appeal. The appeal of his other four-year sentence has already been denied. He will have to serve eight years in prison in total. Authorities have reportedly ramped up their investigation against detained US citizen Michael Nguyen, who is being held on charges of subversion. Activist Le My Hanh was summoned this week for police questioning in relation to Nguyen’s case. Hanh and Nguyen met during Nguyen’s trip to Vietnam in the summer of 2018, shortly before his arrest. Little information has been available about his case, and his family maintains that he was not involved in any kind of activism. Truong Huu Loc remains in detention months after his June 2018 arrest, charged with “disruption of security” under Article 118 of the 2015 Criminal Code for livestreaming to call for protests and supplying protesters with food and water. He was taken into custody a day after large-scale protests against two draft bills on cybersecurity and Special Economic Zones swept the country. He has not been able to meet with a lawyer. 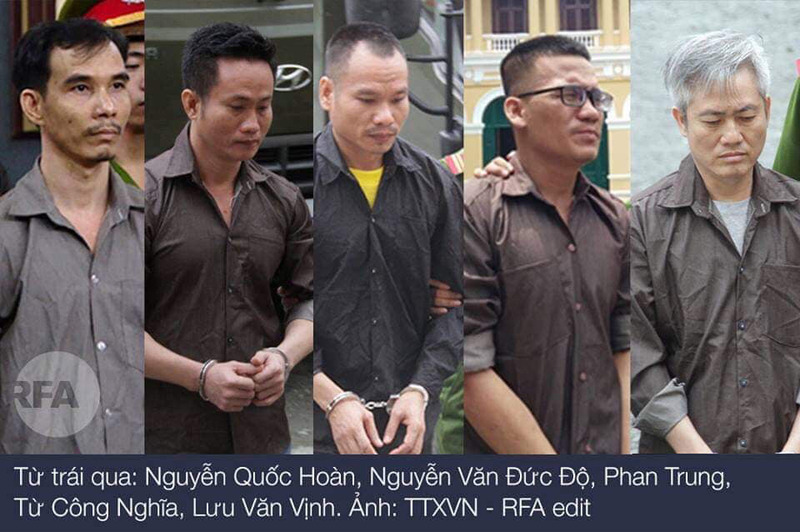 At 9:00 am on January 21, the appeal trial against Luu Van Vinh (sentenced to 15 years) and his co-defendants Nguyen Quoc Hoan (13 years), Nguyen Van Duc Do (11 years), Tu Cong Nghia (10 years), and Phan Van Trung (also known as Thich Nhat Hue, 8 years) began. But since one defense counsel, who was appointed by the authorities for Phan Trung, did not show up, the trial was postponed. No new date has been announced. Vinh took part in environmental and sovereignty protests and founded a pro-democracy group, the Coalition for Self-Determination for Vietnamese People; his co-defendants were tried for their alleged affiliations with the group, which called for political change in Vietnam. This week, we remember the twenty-two members of the An Dan Dai Dao religious environmental groupwho were tried in January 2013 under Article 79 of Vietnam’s 1999 Penal Code. They received sentences ranging from a minimum of 10 years to life in prison (for the founder). The utopian group ran an eco-tourist company in Phu Yen Province, inspired by their religious principles. They organized conferences and produced leaflets to disseminate their beliefs. Those affiliated with the group maintained that the activities of the group were purely religious and that the authorities interpreted their religious teaching in political terms. We also remember Tran Thi Nga, a land and labor rights advocate who started fighting for human rights after her experience as a migrant laborer in Taiwan. Nga was arrested on January 21, 2017, and later sentenced to nine years in prison. She was transferred in March 2018 to a prison farther away from her family and faced death threats from an abusive cellmate there. The UN Working Group on Arbitrary Detention deemed her arrest and detention arbitrary. One year ago on January 23, four Hoa Hao Buddhists were sentenced to a total of 31 years in prison for allegedly making and flying the flag of the former Republic of Vietnam. Vuong Van Tha received a 12-year sentence, and his family is very worried about his condition in prison; as of December 2018, they had been denied visits with him for over 11 months. Tha’s son, Vuong Van Thuan, was sentenced to seven years, and his nephews, Nguyen Nhat Truong and Nguyen Nhat Thuong, were both sentenced to six years in prison. Facebooker Hoang Dung released news on January 20 that police had arrested Nguyen Phuoc Hoang Vu (Facebook account name Paul Vu Nguyen), Pham Ngoc Minh (Facebook account name Hoàng Trường Sa), and their friend when they were drinking coffee in District 3, Ward 5, Ho Chi Minh City. The reason for this arrest was Minh’s t-shirt, which protested the new Law on Cybersecurity. Police took them to the police station at No. 184, Tran Binh Trong Street, District 3, Ward 5, Ho Chi Minh City for questioning. The police finally released them all in the late evening after Minh gave up his t-shirt. On the morning of January 11, 2019, the authorities of Plei Kan Town, Ngoc Hoi District, Kon Tum Province mobilized a powerful force to destroy Linh Tu pagoda when the abbot Thich Dong Quang left for medical treatment. No state media reported this news. After being contacted by a citizen, Facebooker Ngoc Tuyen Dam went to the site of the pagoda and released two articles about the incident. The reason for the destruction was because of the abbot Thich Dong Quang’s “disobedience” towards the authorities. He did not accept being under the control of “state” monk Thich Quang Xa, nor Ngoc Hoi authorities. Despite claiming they respected his religious freedom, the authorities kept harassing the pagoda. The incident came just days after the second round of forced evictions in Loc Hung vegetable garden in Ho Chi Minh City. In a press conference on January 20, 2019, Lieutenant Colonel Nguyen Thanh Loi, police captain of Tan Binh District, Ho Chi Minh City, accused five Loc Hung residents — Cao Ha Chanh, Cao Ha Truc, Tran Quoc Tien, Vu Van Bao, and Tran Minh Thoa — of leading and inciting the others to protest against the authorities when they were on duty at Loc Hung during forced evictions. Police are now in the process of pressing criminal charges against the five. The forced evictions in the Loc Hung neighborhood of Ho Chi Minh City on January 4 and 8 left over 100 homes destroyed and dozens — including many dissidents and veterans of the former Republic of Vietnam — homeless. On January 23, 2019, police disrupted a program held for disabled veterans of the former Republic of Vietnam at Hoa Khanh Church, Lien Chieu District, Da Nang City. These disabled veterans are not recognized as veterans by the Vietnamese government, and thus do not receive any public benefits. Approximately 50 government officials went into the church while 50 others stood outside or waited in coffee shops. A police officer turned off the emcee’s microphone, interrupting the program and making the atmosphere tense. Police of Lien Chieu District said that the peaceful ceremony was disrupted because authorities fear that the veterans will connect with “terrorist” organizations. Concerned citizens are launching a campaign to save Tam Dao, a rain forest national park in the Red River Delta of Vietnam. They worry that a development deal for the park is going on behind closed doors, a decade after another development project there had originally been proposed and later halted. Some say the conflict mirrors that of similar issues of deforestation in the country in recent years, where private and governmental special interest brokers land deals without disclosing environmental impacts to the communities affected. Vietnam underwent its Third Cycle of the Universal Periodic Review by the UN Human Rights Council this week. Both the Vietnamese government and NGO stakeholders were able to submit commentary before the panel. A government representative said that the country had already implemented 175 of 182 recommendations made five years ago at the previous UPR and affirmed a commitment to human rights. However, stakeholders drew attention to the recent escalating crackdown on dissent in the country and refuted the claim that Vietnam does not jail human rights activists. Further, a representative of the Ministry of Justice said that Vietnam will not publicly release data on its use of the death penalty, creating more questions about the application of a practice that has already been heavily-criticized for its secrecy and legal use in drug offenses. This remark came in contrast to the same representative stating that executions in Vietnam are public. Take action with Action by Christians for the Abolition of Torture (ACAT)-France for Vietnamese human rights activists by signing their petition demanding the French President raise human rights with the Vietnamese government, and calling for the release of activists Nguyen Trung Ton, Le Dinh Luong, and Tran Thi Nga. Sign the petition, here (available in English, Vietnamese, and French)!